Never buy Jerky from the store again. Buy a Traeger and make your own. Traeger Beef Jerky is the only jerky allowed in my house. Howdy partner. It’s time to saddle up and head on down the dusty trail. Don’t leave the homestead without some sourdough in one saddle bag, and some beef jerky in the other. Ever since man started killing animals and eating them, they’ve been trying to find ways of preserving them. Jerky, which is basically salt-cured dried meat, has been the most popular method forever. Drying it prevents spoilage, and salt curing it pulls the moisture out and prevents bacterial growth. Modern man has very little actual need to preserve meat this way, but as we all know jerky is insanely delicious. There are multi-billion dollar companies whose main source of revenue is beef jerky. 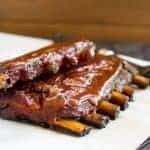 While their products are fine to feed the masses and are easily accessible and available at literally every grocery and convenience store in the US, they lack the depth of beef and REAL smoke flavor that you can achieve by making it on a Traeger. The only thing close to this stuff is going to come from an owner-operator at your local butcher shop. I’ve had some great jerky from places like that and will still eat it if offered, but I can’t spend my hard earned money on it when I can make it at home. I have much the same feeling about prime rib. You may have tried our Traeger Prime Rib over the holidays. If so, hats off to you because it was the highlight of the season for me. 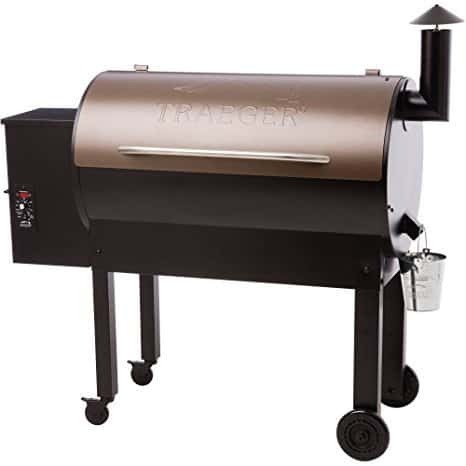 There is also our Traeger Tri-Tip to consider as well for your next cookout for the beef fans in your life. For the chicken lovers, these Traeger Chicken Wings always top my list! 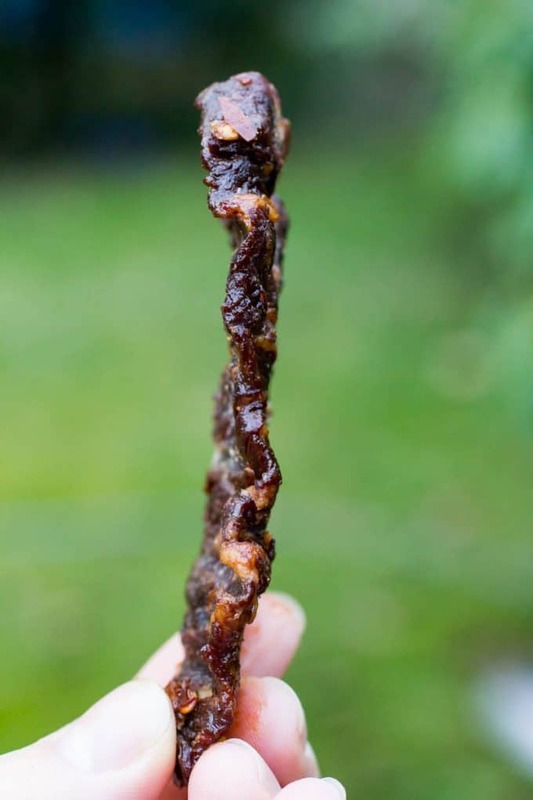 How Spicy Is This Jerky? I almost forgot to give this small warning. This jerky has some heat to it. There is Sriracha and crushed red pepper in the recipe. Like, a lot. If you can’t take the heat, you can always reduce the amounts of each of those ingredients or omit altogether, just never admit to it. I like it spicy. It warms my belly. A lot of the spiciness is offset by the slight sweetness, so you tender bellies just might be able to handle it anyway. Choose a leaner cut of beef, (top sirloin, London broil, flank, etc.) fattier cuts will spoil faster. Make your cuts about 1/4″ thick slicing the meat across the grain. 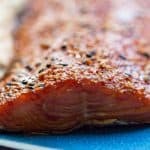 Marinate your meat after slicing for at least 6 hours, but not more than 24. Watch the edges of your grill for hot spots and move pieces away as needed. Never, and I mean never, use liquid smoke in the marinade. Unless you insist. Put it on smoke and leave it on smoke the whole time. 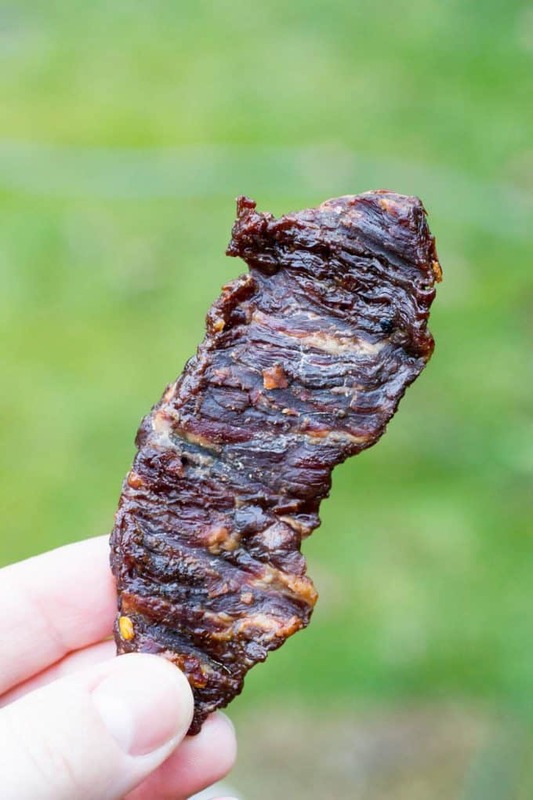 Why Should You Make Your Own Beef Jerky? 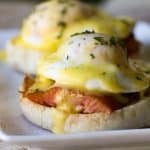 Make sure you double or even triple the recipe when you make this stuff because it isn’t gonna last long. Your spousal unit will love it, as will your kids. You’ll be a hero at work if you bring in a bag for everyone to share on break. I usually make three or four pounds at a time and it lasts for only two to three days, tops. I should probably follow my own advice. 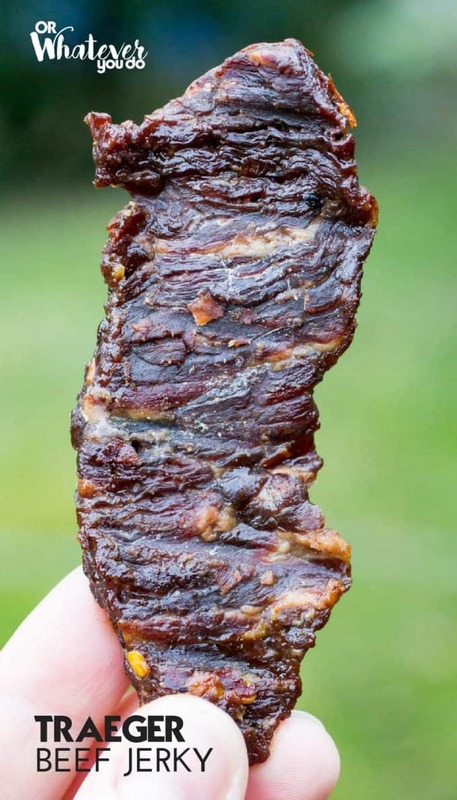 I always wanted to make my own jerky and had intentions of doing it many times before I had a Traeger grill, but I never pulled the trigger as it seemed like a complicated thing. Once I got my T and started reading about it in a couple of Traeger Facebook groups it seemed like it was something I could do without too much trouble. I was right. Once I came up with the recipe for the marinade, making it on the Traeger was easy. If the recipe is followed, success is assured. It’s less expensive than store-bought. I know beef can be pricey, but you don’t need or want to use the fattier, pricier cuts to make jerky. Make sure to look for deals and coupons as ways to save as well. 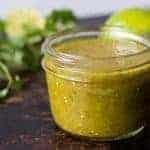 The cost of the rest of the marinade ingredients is minimal. 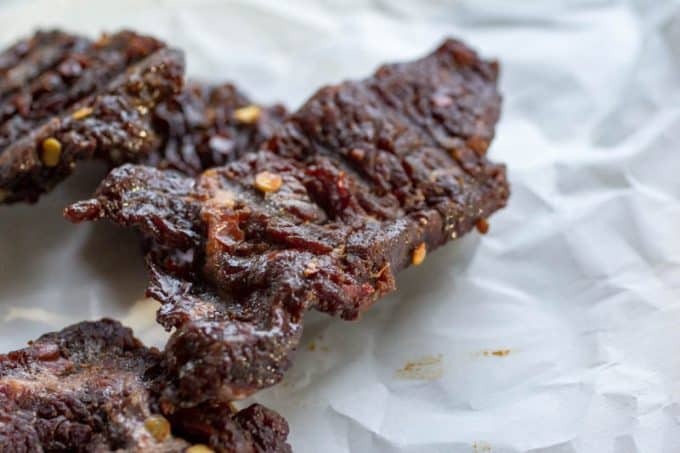 If you try this recipe once, you’ll be hooked for life and will have eaten your last bag of mass-produced, store-bought jerky. The Traeger does many, many things well, and some things exceptionally well. Beef jerky is one of those things. Don’t waste another $15-20 dollars on subpar mystery meat jerky ever again. 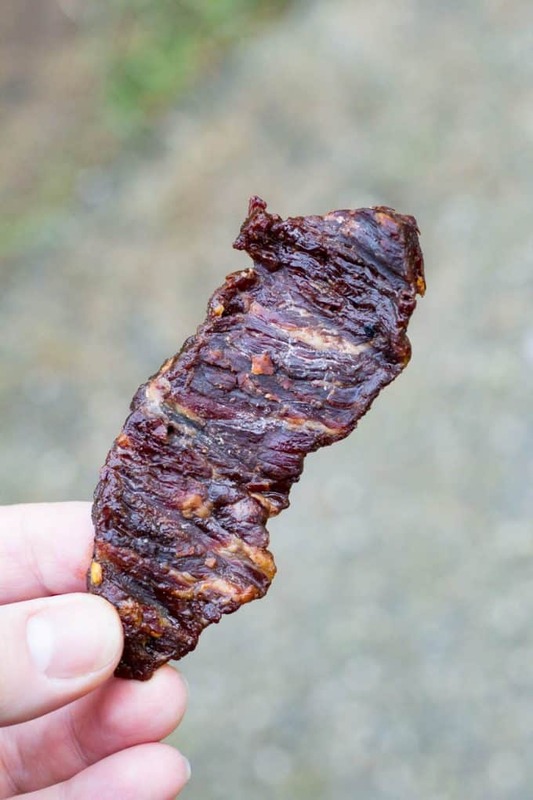 Get your ingredients together, follow the recipe, and try your hand at making your first batch of easy, tasty, and affordable Traeger beef jerky. 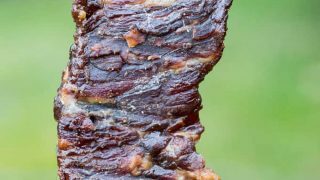 Whether you like or love beef jerky and making things yourself is in your DNA, then this recipe for beef jerky made on the Traeger is the one for you. Sweet, salty, smokey and spicy. It's my go to every couple of weeks. 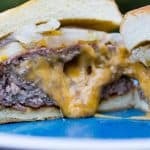 Easy to make, less expensive than store bought, and so good you'll want to slap a sasquatch. 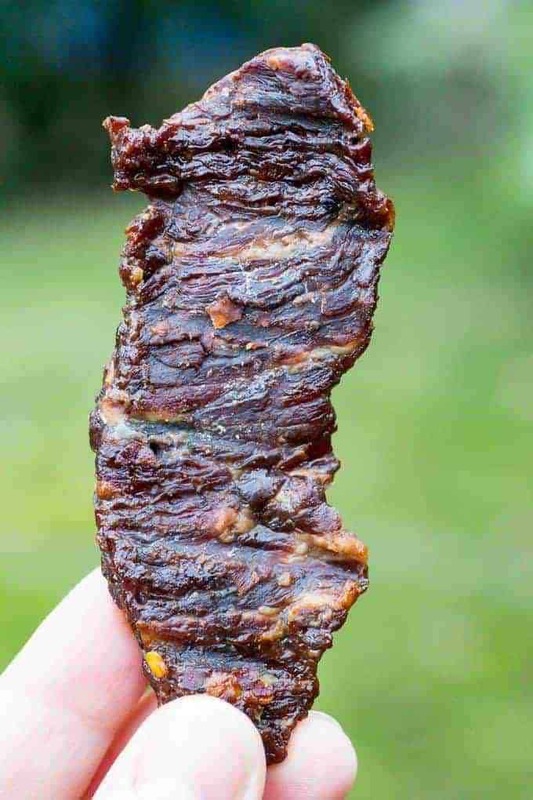 Traeger Beef Jerky! Mix all marinade ingredients into a one-gallon zip-lock bag along with the sliced beef. Seal the bag, making sure to get as much air out of the bag as possible. Put the bag into the refrigerator and let marinate for 6-24 hours before cooking. Remove the bag from the fridge 1 hour prior to cooking. Start up your Traeger grill and put it on the smoke setting. Lay out your meat on the grill with at least a half inch space between all the pieces. Leave on the grill 4-5 hours turning once after 2 - 2 1/2 hours. 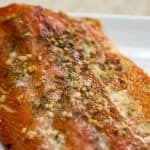 Remove from grill when finished and let cool for thirty minutes to an hour before putting it into the refrigerator for storage. Make sure to get some for yourself before it's all gone. Only addition I made was 1tbs of curing salt. Amazing. Definitely a keeper!! We set ours to “smoke”, which typically keeps it around 140-160, or somewhere in there. I gave up on attempting to read the content of this page due to the excessive advertising and the share options blocking the page. All jokes aside, no ads, no content. 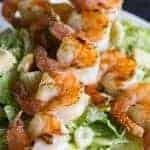 If you’d like to see the recipes without the ads feel free to subscribe to my email list. That’ll get you every post delivered right to your inbox, no problem. 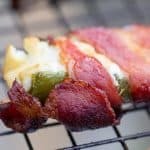 If you want to be a good web citizen and help make it possible for me to continue producing recipes and content, feel free to visit or share the link with your BBQ friends.